This is a 1956 book by this English author. Marlowe writes from an historian’s, not a theological, point of view. His treatment of the Puritans is often refreshing and straightforward but also sometimes frustrating. 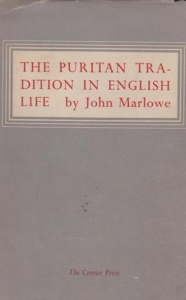 Marlowe seems to be positive when the Puritan history was a benefit to English life and politics and yet negative if their religious life confronted the flow of English history. For example he writes, “They believed that God’s kingdom was not of this world, but they sometimes forgot that this world is a part of God’s kingdom. Believing themselves to be the Elect of God’s kingdom, they tended to look on the world as a foreign country, as a place where they had been sent to work, and as a testing ground for their suitability to be numbered among the Elect.” Marlowe seems kind of disappointed with the Christian point of view.